The compostela is a certificate of completion of the Camino de Santiago, and is issued to you by the Pilgrim's Office in Santiago de Compostela. 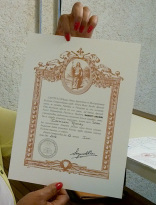 There are two types of certificate: one is in Latin, and is issued to pilgrims who declare that they did the camino for religious or spiritual purposes. Your name will also be written in Latin. The second certificate is for those who did it for cultural or historical purposes. This one is written in Spanish. Both are testament that you have done the Camino de Santiago. You will be asked for the purpose of your pilgrimage at the Pilgrim's Office desk, and you will be given a form to fill in. How Do Pilgrims Qualify for a Compostela? To receive it, you must have completed the last 100 kms of the camino if you are walking or on horseback, or the last 200 km if you rode a bicycle. It does not matter how many kms you have walked on the camino trail if you do not make it to Santiago de Compostela. For the officials of the Santiago Cathedral, the point of the pilgrimage is to reach the tomb of St. James. In the last 100 km (walking/horseback) or 200 km (cycling) you must also have at least two or three stamps per day in your pilgrim's passport to prove that you did not get buses or taxis. Click here to find opening times, location, services, pilgrim's statistics and much, much more. When you arrive in Santiago de Compostela, you may go straight to the Pilgrim's Office to get your compostela. Check this link for opening times of the Pilgrim's Office. Depending on the time of year, and the time that you arrive, you may have to wait in a long queue. Once you get into the office, you will be asked some questions about the purpose of your pilgrimage and you will have to fill in a form. You will be asked to produce your Pilgrim's Passport for proof. You will then receive your compostela and a protective cylindrical container (you'll pay one or two euros for this). Your country of origin and the date of your arrival in Santiago de Compostela will be forwarded to the officials who will perform the next Pilgrim's Mass. At this mass, a list of countries and how many people from those places arrived that day will be read out. The Pilgrim's Mass is performed every day at 12 pm: if you arrive at the Pilgrim's Office after 12 pm, your announcements will be made the next day. This takes place every day at 12 pm, though during the holy years, the Pilgrim's Mass is held more than once a day. Quite often, the Botafumeiro is swung in dramatic fashion during the service. It is a huge censer filled with incense, and it swings as the Hymn of Santiago is sung. It is a wonderful ending to a deeply spiritual experience, and if you get lucky enough to witness it, you will never forget it. Please be reminded that it is not always brought out. Too many pilgrims are disappointed because they believe that the Botafumeiro is a natural part of the Pilgrim's Mass. You can just hope that it happens while you are attending!